People dressed in colorful traditional costumes walked down the street for the michijune parade at the First Commercial Avenue in Okinawa City on March 1. For the Doll’s Festival, people dressed in traditional Ryukyuan costume walked through the streets in a michijune parade in the First Commercial Avenue in Okinawa City on March 1. One hundred people dressed in bright costumes paraded down the street. 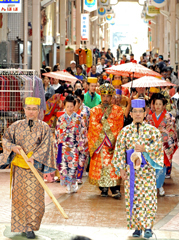 The parade featured the procession of the kings who used to live in Goeku Gusuku Castle. The participants took about 20 minutes to parade down the street and the many people watching applauded them. About100 hina dolls were displayed in the windows of the vacant stores on the street. Various events such as a workshop for making sweetened rice-flour cakes for the festival and a fashion show for the traditional costume attracted visitors.